Security auditing is one of the most powerful tools that you can use to maintain the integrity of your system. As part of your overall security strategy, you should determine the level of auditing that is appropriate for your environment. Auditing should identify attacks (successful or not) that pose a threat to your network, and attacks against resources that you have determined to be valuable in your risk assessment. In this blog post, I discuss a common security audit policy configuration I come across in a number of environments (with special focus on Account Management). 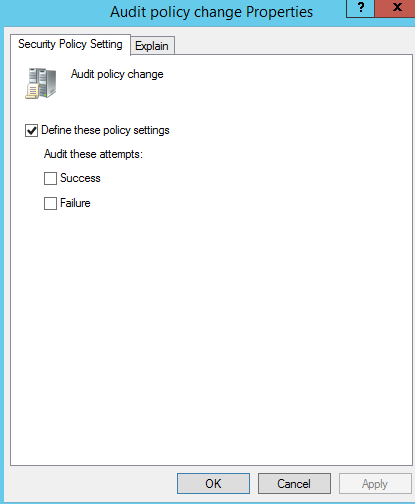 I also highlight the difference between basic and advanced security audit policy settings. Lastly, I point you to where recommendations that can help you fine-tune these policies can be obtained. Here we see a lot of events from the Filtering Platform Packet Drop and Filtering Platform Connection subcategories – the image shows ten of these within the same second! It can also be seen that there was an event relating to a successful Directory Service Access (DS Access) activity, but this is only one out of quite a bit! auditpol /get /category:"DS Access,Object Access"
The output below reveals that every subcategory in both the Policy Change and DS Access categories is set to capture success and failure events. Do we need all these security audit events? Let us look at what some of the recommendations are. Guidance from tools such as the Security Compliance Manager (SCM) states that if audit settings are not configured, it can be difficult or impossible to determine what occurred during a security incident. However, if audit settings are configured so that events are generated for all activities the security log will be filled with data and hard to use. We need a good balance. This subcategory reports when packets are dropped by Windows Filtering Platform (WFP). These events can be very high in volume. The default and recommended setting is no auditing on AD domain controllers. This subcategory reports when connections are allowed or blocked by WFP. These events can be high in volume. The default and recommended setting is no auditing on AD domain controllers. This subcategory reports when replication between two domain controllers begins and ends. The default and recommended setting is no auditing on AD domain controllers. These descriptions and recommendations are from SCM but there is also the Policy Analyzer, which is part of the Microsoft Security Compliance Toolkit, you can look at using for guidance. There’s also this document if you do not have any of these tools installed. Turning on everything – success and failures, is obviously not inline with security audit policy recommendations. 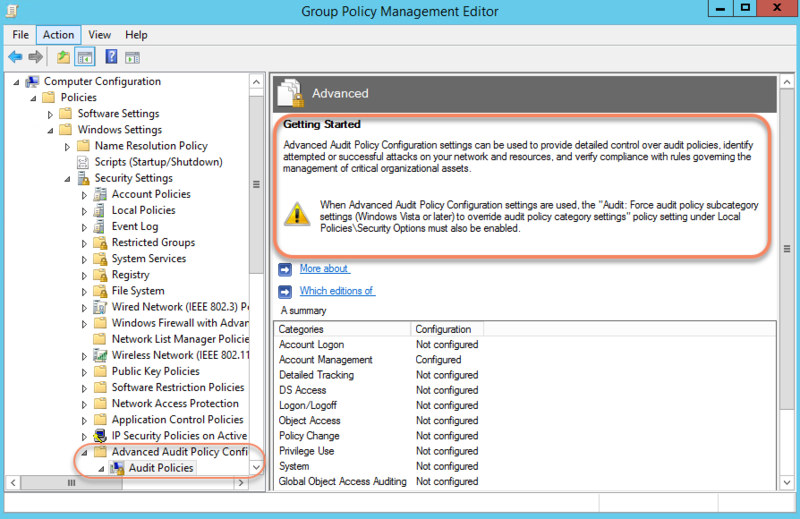 If you have an environment that was built on Windows Server 2008 R2 or above, the advanced audit policy configuration is available to use in Group Policy. If you already have settings configured in the basic audit policy and want to start leveraging the advanced audit policy in order to benefit from granularity offered by the latter, you need to carefully plan for the migration. In case you are wondering what I mean by granularity, see a comparison of the two below. Keep in mind that these events are local to each DC, and that the event logs are configured to overwrite events as needed (oldest events first) by default. Solutions such as System Center Operations Manager Audit Collection Services can help capture, centralize and archive these events.